Might I start off by saying this is our first post and we are super excited to get this blog rolling! So what is this post all about? Well, last week we held the biggest, most educational, workshop week like EVER. Excuse my informal writing but what can I say i’m a little high on caffeine and this is the Lawrence Heights Justice Group were talking about here! Here’s a mini breakdown…awesomeness. We started off the week (which I would classify more as a whole month of activities) cooking and talking to kids about the importance of exercise and diet. Mhmmm, can you say chicken wraps, salad’s, and fruits 3x fast. 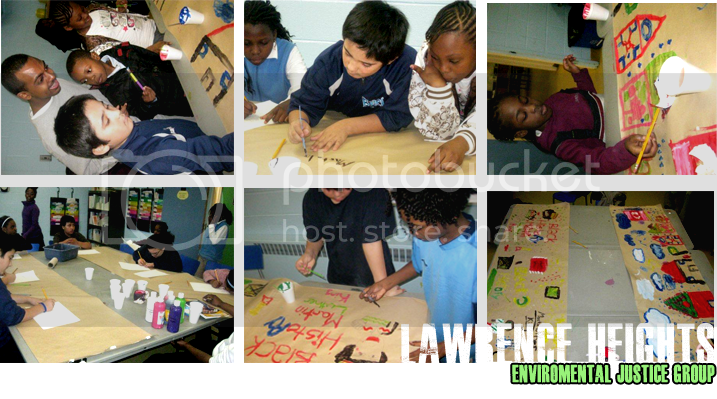 Many kids from the Lawrence Community asked us how we can teach them to prepare their own snacks. And of course we delivered! Teaching them how to create simple pita pizza’s with little help from an adult. The following day we asked the kids “What their community meant to them”. They brainstormed and drew their own pictures and collaborated on two huge murals. Art is always a fun way to not only had fun to a program but also as a reflection period. Hardly, do you ever notice that a lot of what your produce reflects your perspective. And it was interesting to see the bond the children felt to their community, peers, the centre, and their mentors. They truly have a connection with this community and it was great seeing them all help each other and share their idea’s. The room – in all honesty – changed from disorder and confusion to complete harmony once we told them the task. Not to mention how difficult it was for them to separate themselves from what they have done. So with this I say goodbye for now. Expect more pictures and posts from the LHEJG!